According to this, the solution is to start PowerShell as an administrator. Ordinarily, this can be accomplished by right-clicking PowerShell and selecting "Run as Administrator". Is there a way to do this programmatically? I know this is an old post, but we ran into this same problem recently. When we had done this previously, without scoping, we were setting the execution policy for Administrator. Visual Studio \ C# was running as the current user, causing it to fail with insufficient permissions. Administrative privileges are at the application level. The app that needs admin access in this case is yours. Creating runspaces in C# in a custom app does not invoke powershell the application - it just loads some assemblies into your application. That said, you can elevate as the other poster said although embedding admin usernames and passwords into source code make me feel ill. I think an alternative model would be to wrap the powershell executor into a simple asp.net webapi webservice. The webservice could then be configured to run with the required permissions needed to do it's job. It can provide it's own security to determine which clients can call it. To execute a script, you would just call webservice methods. You could make the method quite general - script name and params. It's a bit more work, but a lot more secure (see x0n's thoughts). Strictly for DEV environment This is relatively very old post. But I have found a new way to do this. I am hosting the C# web api on IIS 8 having some powershell code that I want to run with administrator privileges. 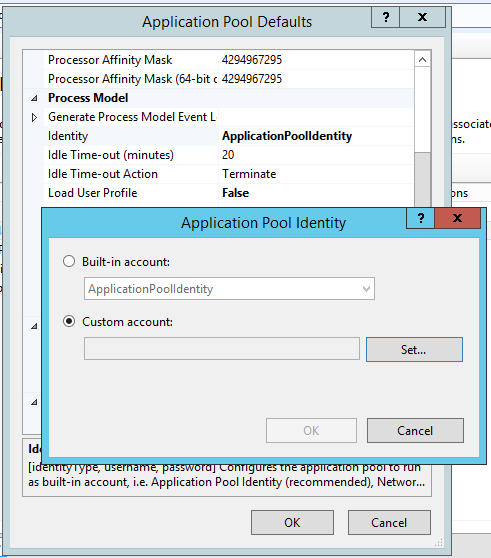 So I provided the admin credentials in the Application pool identity setting. Just set administrator account in app pool identity. How to run PowerShell from C# as administrator?